If they were going to save the world, there was something missing from the equation. Gary Grossman was having lunch with longtime friends and colleagues Robert Tatsumi, Peter Santangeli and Jonathan Gay. It was 2006, and the four had recently left their jobs at Macromedia, the company that eventually took over Flash before it was purchased by Adobe Systems in late 2005. Self-proclaimed tech geeks (and world-proclaimed tech geniuses), the creators of Flash could hardly be expected to spend a future sequestered to family life. Each had come from vastly different backgrounds, yet they'd spent most of their lives up to this point devoted to the same goal: making Flash a success. Now they had a new problem to solve: build a system to combat the energy crisis, save people money and educate them on the power of energy awareness, roll it out to utilities and millions of other clients around the country, watch the dough roll in and possibly save the world. All they needed was Grossman's OK, and Greenbox would officially begin. Blocks away, Matthew Smith was mulling over a similar quandary. He had spent his career introducing revolutionary technology to an eager public, but he wanted something more. "I had worked on some really cool products, but they weren't necessarily making the world a better place," says Smith. "Some were probably even part of the problem." Now, with an MBA in sustainable management, he wondered how he could apply his background in technology to sustainability. Then the light went on. "We like it when people take public transportation," says Smith, 41, as he pulls up to the San Bruno, California, BART station. At 11:30 a.m., the station seems more akin to a scene from a Western than a bustling transportation hub for Silicon Valley startups. Within minutes, we arrive at the Greenbox building. The surroundings are humble compared with how the company aims to change the future of energy. The conference room, just days old when I arrive, is outfitted with a small brown couch, two white chairs and a coffee table, plus a projector that disappears every Halloween for Santangeli's neighborhood house decorating contest. It's as if they're constantly moving into this space, which they've actually occupied for two years now. How Greenbox Thinks Outside the Box. 1. Have a vision. Gary Grossman grew up watching his parents build their computer programming company from the ground up. While things never took the way Flash did, his parents found their own level of success. "I thought, 'Hey, you can make it on your own,'" says Grossman. "It just takes persistence and determination." 2. Have the courage to start anew. After years under the Flash umbrella of success, fathoming a new, riskier venture wasn't easy. "It's hard to leave something that's a success," says Jonathan Gay. "But this was an interesting new problem space where we thought we could learn something." 3. Understand your customer. 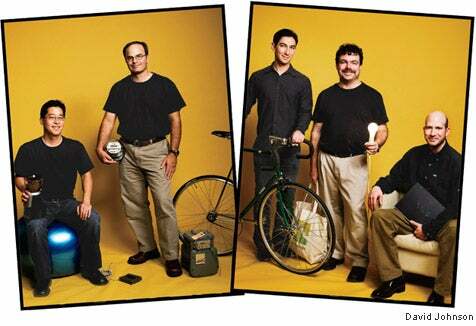 For Gay, starting Greenbox was as much about creating a new interface as it was about "not just being computer geeks." So Gay and the team set out to really understand what consumers wanted. "It's not just about how much energy you're using," says Gay. "It's also about understanding the emotion and ways [customers] can digest it." 4. Know the art of what's possible. Innovation is not just a side effect for the Greenbox team--it's a way of life. "We don't feel limited by what you can do with a box or a button," says Peter Santangeli. "We think, 'How should it work?'" 5. Think about your product. The Greenbox team critically thinks about each new addition and is quick to redefine the product even if it hurts. "You have a lot of close starts," says Gay. "You have to be agile. You have to be willing to change ideas." There are more important matters than redecorating at stake here: for one, changing the way people use and understand energy. "We're calling it interactive energy management," says Smith, Greenbox's vice president of marketing. "How do you get [homeowners] more engaged with how, where and when they use energy and give them the tools to make better decisions?" Smith was the last to join the Greenbox team. While each member of the team plays a critical role in the success of this technology, Smith's contribution is perhaps the most vital. It's his job to make sure Greenbox is picked up not only by Flash proportions (which Santangeli tells me is now installed on more than 1 billion PCs and devices) but also nationwide--perhaps even worldwide. We settle into the conference room, and with a confidence that says he's done this many times before, Smith begins to impart to me exactly how Greenbox plans to save the world. The 2-year-old company is at the far end of the problem of turning energy awareness into consumer action. "Utilities have their backs against the wall in looking at what the demand for electricity is over the next five to 10 years," Smith says. "In most cases, it's outstripping what they have planned in terms of their generational capacity. There's a general feeling that they can't build their way out of this problem." Greenbox's solution is much like a game, meant to help consumers understand their energy usage and how they can save money. To do this, the company is partnering with various utilities around the country to provide real-time data to consumers. A simple user interface at getgreenbox.com lets users choose between various functions, including a basic overview of the energy being used in their home, the price of electricity, usage by day and month, an interactive timeline, rate structures and usage alerts. One can't help but wonder about the future reaches of this technology, which appropriately embeds Flash graphics and is so far is available in a basic and advanced version. Recently, it rolled out with a number of utilities after a successful trial run with Oklahoma Gas & Electric. The team plans to integrate smart appliances with smart thermostats that can adjust automatically and let neighbors compare home energy use with one another. A bit further off: electric carports and electricity bills priced like cell phone plans. When I finally meet the rest of the team, I'm struck by how down to earth they all are. Santangeli, 43, is the most outgoing of the crew. As a key engineer for Greenbox, he's seen the technology evolve at least half a dozen times since launch. He admits with a sudden seriousness that much of that innovation would be null without the other founders. "Any company, any product is a series of problems," says Santangeli. "You start with the customer's problem, then you find a solution. And that solution implies a whole bunch more problems you have to get through." In many ways, it was a series of problems that brought the five of them together. It just so happened that the problems each camp was desperately trying to solve were one and the same. So it was no surprise that when Smith was introduced to Santangeli and Gay--each an industry legend in his own right (at 16, Gay created Dark Castle, one of the first games for Macintosh computers, while Santangeli built a name for himself as one of Macromedia's star engineers)--the three instantly hit it off. "It just felt like complete kismet at some level because I was making this business plan and had a lot of ideas, but I'd never been an engineer," Smith says. "And then when I met these guys, I was struck by their insight and understanding of how to quickly bring a product to market. They've done it so many times that they don't waste their time on mistakes they made 10 years ago." In a way, they are characters in a story they've already written. Each has his own superpower: Gay, 41, is the visionary; Santangeli is the engineer; Tatsumi, 46, is the catalyst; Grossman, 34, is the creator; and Smith is the voice. Yet, without the others, the ideas would stop and Greenbox would grind to a halt. It helps that most of the company's team of nine were actually former employees of Macromedia. Even one of Greenbox's primary investors, Rob Burgess, was once CEO there. But more than their connection to one another is their unequivocal desire to be almost modern-day superheroes, breaking out of their tech geek shells to solve the world's problems. "When you're 50, you want your kids to look at you and say, 'Dad, you did good,'" says Santangeli. "[Greenbox] was an opportunity to leverage what we know and be a force for good in the world."